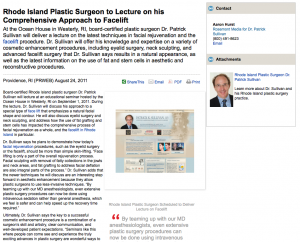 Plastic Surgeon in Rhode Island to Deliver Lecture on Facelift - Patrick Sullivan, M.D. At the Ocean House in Westerly, RI, board-certified plastic surgeon Dr. Patrick Sullivan will deliver a lecture on the latest techniques in facial rejuvenation and the facelift procedure. Dr. Sullivan will offer his knowledge and expertise on a variety of cosmetic enhancement procedures, including eyelid surgery, neck sculpting, and advanced facelift surgery that Dr. Sullivan says results in a natural appearance, as well as the latest information on the use of fat and stem cells in aesthetic and reconstructive procedures. Board-certified Rhode Island plastic surgeon Dr. Patrick Sullivan will lecture at an educational seminar hosted by the Ocean House in Westerly, RI on September 1, 2011. During the lecture, Dr. Sullivan will discuss his approach to a special type of face lift that emphasizes a natural facial shape and contour. He will also discuss eyelid surgery and neck sculpting, and address how the use of fat grafting and stem cells has impacted the comprehensive process of facial rejuvenation as a whole, and the facelift in Rhode Island in particular. Dr. Patrick Sullivan is a faculty member at the Brown University School of Medicine. He is a fellow of the American College of Surgeons, and is double board-certified by the American Board of Plastic Surgery as well as the American Board of Otolaryngology. Dr. Sullivan maintains a rigorous speaking schedule throughout the US and international community, and will present this information at the September 2011 Annual Conference of the American Society of Plastic Surgeons (ASPS). Dr. Sullivan’s plastic surgery practice is located at 235 Plain St. #502 Providence, RI 02905, and can be reached at (877) 435-3223 or found online at drsullivan.com or facebook.com/doctorsullivan.